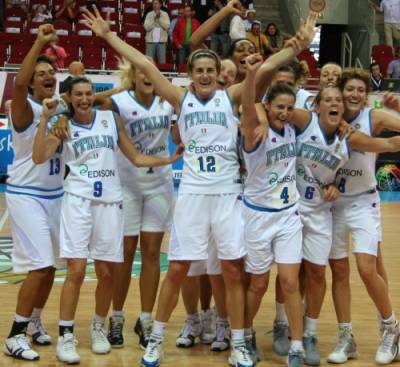 Italy's adventure at EuroBasket Women 2009 continues. They beat Lithuania (72-58) with 17 points coming from Marte Alexander. Belarus needed to win by 7 points to qualify for the quarter-final. They beat Turkey (86-70) with the last points coming from Yuliya Dureika. As Belarus won by more points than Italy they move ahead of Italy into third position in the EuroBasket Women 2009 group standing. This also means they do not play Spain in the quarter-final. France remain unbeaten after beating Russia (72-66) in the final match of the evening to win EuroBasket Women Group F.
Sandrine Gruda led France with 18 points and Céline Dumerc finished with 17 points. For Russia Becky Hammon led the Russians with a game high 18 points. Her audio comments will be found after the match report. Sandra Valuzyte from Lithuania picked up 2 quick fouls within 100 seconds from the start of game. She was not able to defend as she would have liked during an intense first period. Gintare Petronyte scored the first 5 points for Lithuania while Laura Macchi and Marte Alexander scored for Italy. Raffaella Masciadri then put Italy in the lead with a trey (7-5). The two teams started trading baskets regularly. Italy did most of their work inside the paint while Lithuania relied on clutch shooting from Egle Stakneviciene and Ausra Bimbaite. Lithuania were dangerous from behind the arc with Bimbaite connecting twice. Her second three-pointer was to tie the game (17-17). Italy finished the first period strong and ended the first period in front (21-19). Rutenis Paulauskas, the Lithuanian head coach, decided with just over five minutes to play in the second quarter that he needed a time-out. Simona Ballardini from Italy was not having a productive game offensively with just 2 points to her name. So she returned to the bench after turning over the ball while driving to the basket. Valuzyte played through her early foul problems and controlled the pace of the game as Lithuania increased their lead (35-29). Manuela Zanon and Marte’s foul problems complicated things for Italy. Despite Ballardini's lay-up on the buzzer, Lithuania led at the interval (37-31). Italy decided to press their opponents at the start of the third period. With just over three minutes played Lithuania had committed 4 team fouls. Italy continued the system and regained the lead through Alexander connecting from the land of many. Masciadri completed the 10-0 run by concluding a fast break (41-37) which resulted in a Lithuanian time-out with just under six minutes to play. Lithuania ended the barren spell with exactly four minutes remaining in the quarter as Agne Ciudariene was left free under the basket. Italy continued playing in the same way while Lithuania adjusted and started to run more into the paint. However Italy went into the final period ahead (48-43) after Ballardini hit a turn-around jump shot that left her sliding down the floor. Kathrin Ress picked up 3 fouls in the first 70 seconds of the final period for Italy. So she had to return to the bench. For Lithuania Valuzyte picked up 2 quick fouls and had to leave the game for good with 81/2 minutes to play. 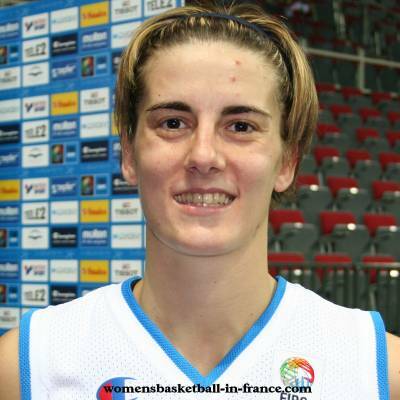 During this time the only points for Italy came through Mariangela Cirone at the free-throw line. The game went through a rather scrappy phase with both sides turning over the ball a number of times and missing what appeared to be easy shots. Italy led (55-48) with five minutes to play after Alexander found herself in the zone under the basket to score. The Lithuanian coaching staff decided it was time for a time-out. They switched back to the system they played in the first quarter and it worked well as Stakneviciene fired in a three-pointer. Lithuania scored again from the free-throw line. But their run ended as Ballardini fired a shot in from beyond the arc. Then Alexandra scored with a lay-up and drew a foul. She converted the free-throw (62-53). Macchi was to foul out for Italy. Yet this did not stop Italy as Masciadri hit her trademark 3-pointer jump shot as the game entered money-time (66-55). Alexandra was having a field day under the basket and scored again and drew the foul, Shortly afterwards Ballardini made the game safe. Italy won (72-58) and have qualified for the EuroBasket Women 2009 quarter-final. 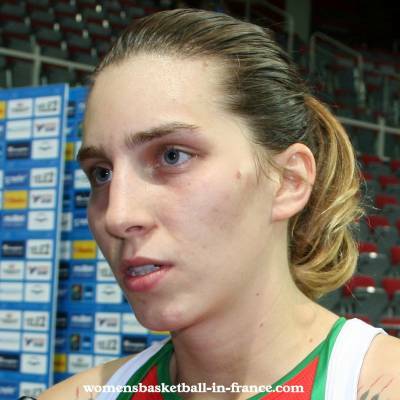 EuroBasket Women 2009 audio after match comments Raffaella Masciadri said she was very happy for the EuroBasket Women quarter-final qualification after missing out during the 2007 edition. She thought that they were more intense and they played better as a team. Kathrin Ress said it felt good to be in the last 8 because this had not happened for many years. She added that qualifying for the quarter-final and having the dream of finishing higher was like a big emotion for everybody. She also explained what happened in the first half and that the coach told them at the interval to go back to the game plan. The two teams went on the attack right from the start with Belarus scoring first and staying in front for the first five minutes (14-10) with 7 points coming from Nataliya Trafimava. Natallia Marchanka, playing in a face mask, started a sequence of three-pointers for Belarus. With Marina Kress and Trafimava connecting Belarus extended their advantage (23-14) with seven minutes played. Turkey weathered the storm and with Sariye Gökce and Bahar Caglar scoring they were quickly back on the tail of Belarus. The last minute was frantic and both sides went for their shots. Volha Padabed scored the last points of the first period just on the buzzer for Belarus (27-21). Belarus opened up the first significant lead of the game after Yelena Leuchanka was allowed to run to the basket and reverse spin to lay up (33-23) with just over seven minutes to play. Then Birsel Vardarli from Italy was allowed to score back to back 3-pointers for Turkey. Also Katsiaryna Snytsina from Belarus hit a three-pointer which she quickly followed up with a baseline jumper of 2 points. The two teams continued to play at a quick tempo and most of the points came from distance shooting. Belarus held on to the lead (43-37) with one minute left to play in the second quarter. Anastasiya Verameyenka was the centre of movement for Belarus as she controlled the paint at the defensive end with 3 blocks. But she was also responsible at the offensive end for three assists as her side went into the locker room leading (45-37). Belarus reverted back to what they did best at the start of the third period with shooting from beyond the arc from Trafimava and Tatyana Troina (53-41). However Turkey also shot from far with Saziye Ivegin hitting a three-pointer. Turkey were more dangerous in fast breaks and continued to lower the deficit (49-55) with four minutes left in the third period. Turkey’s advance was stopped by Snytsina who came to the rescue of Belarus with 5 points. Belarus were back with 10 points in front after Leuchanka hit two free-throws. The offensive festival continued right up to the buzzer with Belarus in front (67-58) going into the final period. After the offensive festival of the first three periods, the first four minutes of the final quarter were dull with only 3 points scored by Troina. Troina hit another three-pointer with four minutes left to play as Belarus pushed the lead up to 14 points (74-60). Belarus became more patient in their approach with Marchanka running the plays. She set up Yuliya Dureika for the final knock-out blow with 2:21 minutes remaining who then had all the time she needed to fire in a three-pointer (81-65). Turkey did not give up. However with Ivegin and Nevin Kristen Nevlin they ran out of time and luck leaving the victory for Belarus (86-70). EuroBasket Women 2009 audio after match comments Marina Kress explained that they had troubles in the first round of games but today and in the previous game they had improved. So she hoped that they would play even better in the next game. Katsiaryna Snytsina knew that they had to win by 8 points to qualify.They were informed that if they finished third the following game would be against the Slovak Republic. Sandrine Gruda scored the first points of the game and France got off to the best of starts with a trey from Céline Dumerc for France to lead (5-2) after only a minute played. Ilona Korstin was making life difficult for France with 6 quick points as Russia regained the advantage (10-7). The battle in the paint between the Maria Stepanova and Gruda was living up to expectation. Both sides defended well under the basket making scoring hard. However Russia moved 6 points clear as Becky Hammon knocked down a trey (17-11) with 4 1/2 minutes remaining to play in the first period. Isabelle Yacoubou-Dehoui was throwing herself about at both ends of the court. Hence France came right back into the game with a Dumerc baseline trey (18-19). France led briefly after Yacoubou-Dehoui tapped the ball away from Stepanova. She went all the way to the basket, yet her lay-up did not go in. But Emilie Gomis followed up to pick up the rebound and scored. Russia quickly regained the advantage. 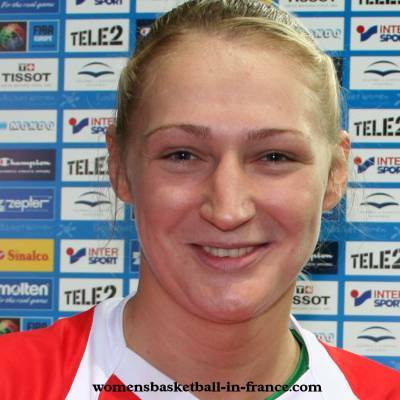 But France ended the first quarter level with Dumerc hitting a running jumper from beyond the arc on the buzzer (23-23). France became more aggressive at the start of the second period and hustled the Russians into turnovers. Gruda was at the end of all the French moves with 6 points as France regained the lead (29-25). Stepanova was everywhere for Russia and added 2 points from the free-throw line. Anaël Lardy was on briefly and had the task of watching Hammond. For the split second Lardy took her eye of her, Hammon made some room way behind the the arc and hit a three for Russia to go back in front. However France were back on level term when Olga Arteshina was called for an intentional foul at mid-court on Emméline Ndongue. Ndongue hit the free-throw and through Gruda France was back in front. Yacoubou-Dehoui was on fire and appeared to be enjoying the physical battle with back to back baskets for France to lead (37-31) with three minutes remaining in the second period. France continued to dominate and went 8 points clear after Yacoubou-Dehoui blocked Irina Osipova. This led to Gruda scoring at the other end. However France made one mistake: leaving Hammonn wide open for her to hit a period-ending three-point buzzer shot. France still led (41-36) at the interval. Dumerc and Hammon traded three-pointers at the start of the third period. Both teams were strong defensively and points from open play were difficult to come by. As a result most of the points came from the free-throw line with France holding on to the lead (48-42) after five minutes of the quarter. The game came to a climax in the last seconds of this period. Lardy went coast to coast for France and then Korstin hit a buzzer beater three-pointer for Russia. Then Pierre Vincent and the Russian General Manager had a clash of words on the side line. France led (50-47). France and Russia played very physical basketball at the beginning of the final quarter and Russia reduced their deficit (51-52). France then switched to distance shooting. With three-pointers coming from Emmanuelle Hermouet and Cathy Melain, France moved 10 points clears (63-53) with five minutes left to play. After a time-out called by Russia, the system of play changed. It was the turn of Svetlana Abrosimova to score from down-town.Stepanova also came in the action and knocked in 2 points. France were now in trouble and on the back foot and then allowed Marina Karpunina to steal it and score. It was the turn of Vincent, the French coach, to call a time-out as his team's lead was just 3 points (65-62) with three minutes remaining. France hung on to win (72-66). 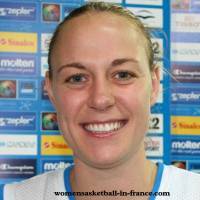 EuroBasket Women 2009 audio after match comments Becky Hammon mentioned that offensively they did not do well and that they allowed Sandrine Gruda and Céline Dumerc (point guard) to have a good start. She also mentioned that she was told that they always lost one game at EuroBasket Women and she was hoping that this game was the only one. She went into detail about the chances they had at the end but the ball just would not drop and that was it. She finished by saying that she was still learning about the format of the competition. However she is excited to be playing at a European Championship. 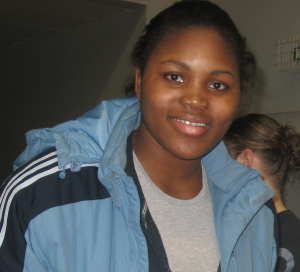 Isabelle Yacoubou-Dehoui explained in French that the victory was nice but the quarter-final started the following day, so they had won nothing yet. She concluded that they needed to remain focused for the rest of EuroBasket Women 2009. Emmanuelle Hermouet explained that for the moment all was well because of the victories including those matches that were taken to the wire. She is of the belief that the difficulties were beneficial because the players were young and it helped them in the match this evening and proved that they could cope in difficult situations. She was happy with the victory.